The cheeziest nuggets, made with Field Roast’s Creamy Original Chao Cheese Slices! #freefromanimals, ooey-gooey and wicked delicious! We’re serving with our Nana’s Marinara to bring you the best. Nana’s Marinara (recipe below), or if jarred sauce is used – Rao’s Marinara is the only one we suggest, and closest to Nana’s. Set up a station with three medium-sized bowls. Add one portion of the flour to the first bowl. Add the remaining flour to the second bowl, adding in half the salt and cornstarch to the second bowl. Mix well, then add in the water and whisk until smooth – the consistency should be similar to an egg wash in thickness. In the third bowl, combine the panko, nutritional yeast, Italian seasoning, garlic and onion granules and fresh cracked pepper. To bread the cheese, work in small batches of 2 or 3 pieces at a time. Dust the cheese slices in the first bowl, tapping off any excess. 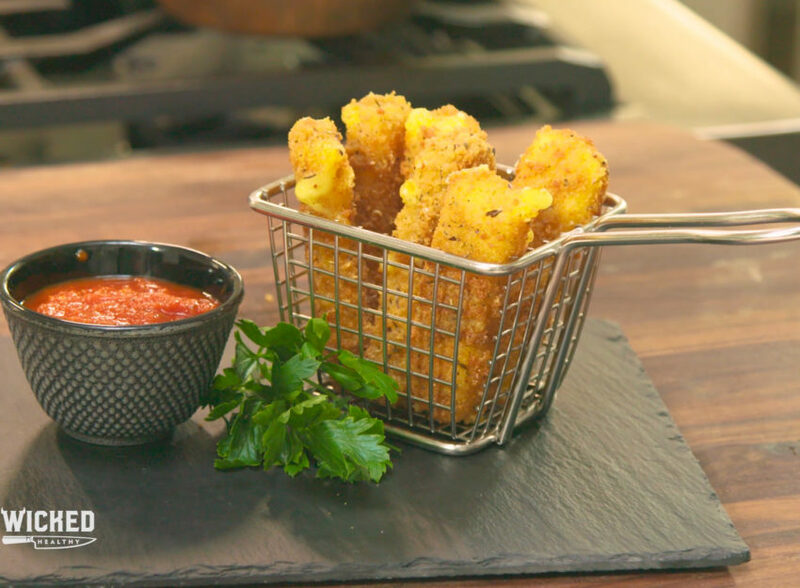 Dunk the cheese into the wet mixture, then transfer to the panko mixture, pressing the breading evenly over the cheese. Transfer the breaded cheese to a plate and repeat the process with the remaining cheese. Critical step. Place the plate of cheese sticks into the freezer to chill for at least 30 minutes before frying. By chilling the sticks they will fry much better and keep the breading intact during the process. To fry the cheese, bring several inches of oil to 350 or 375 over medium heat. Test the oil with a crumb of the breading. Once the oil is ready, gently drop the cheese into the oil, working in small batches, and fry until golden brown all over. Transfer to a cooling rack gently placed over a baking sheet to catch excess oil and repeat the process with the remaining cheese. 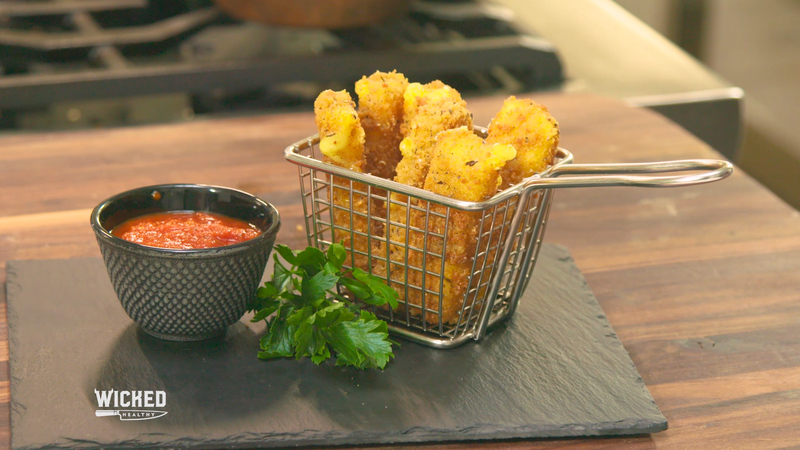 Serve immediately with Nana’s marinara sauce. Heat a large sauce pot over medium-high heat. Add enough oil to cover the bottom of the pot. Sauté the onions in the oil until they look golden around the edges, about 4 minutes. Add the garlic, bell pepper, and oregano. Sprinkle with a little salt and pepper, then sauté until the peppers are soft, about 5 minutes. Use your hands to pinch and pull out the canned tomatoes’ cores, then crush the tomatoes right into the pot. Add the tomato paste and sugar. Fill the tomato paste can 4 times with water, adding the water to the pan, and stir until incorporated. Simmer the sauce uncovered over low heat for 1 to 1½ hours, stirring now and then to prevent burning. Use an immersion blender in the pot, or an upright blender, to puree the sauce—or, for the perfect rustic texture, use a food mill. Return the sauce to low heat and simmer until the flavors blend, an additional 1 to 1½ hours. Taste the sauce, and add salt, pepper, and sugar until it tastes good to you. Remove from the heat and stir in the basil. *Cheater chopping: Pulse the onion in a food processor. While it’s sautéing, pulse the garlic and bell pepper as well. Then chop the canned tomatoes the same way. If you use a food mill when it’s done cooking, the mill will strain out the seeds for you. *Nana used fresh tomatoes whenever possible. To do that, peel, seed, and chop 6 pounds fresh San Marzano tomatoes and use instead of the canned. *If your tomatoes are sweet enough, you will not need the pinch of sugar. Alternatively, you could get a little sweetness by adding ½ cup finely shredded carrot when sautéing the onions.